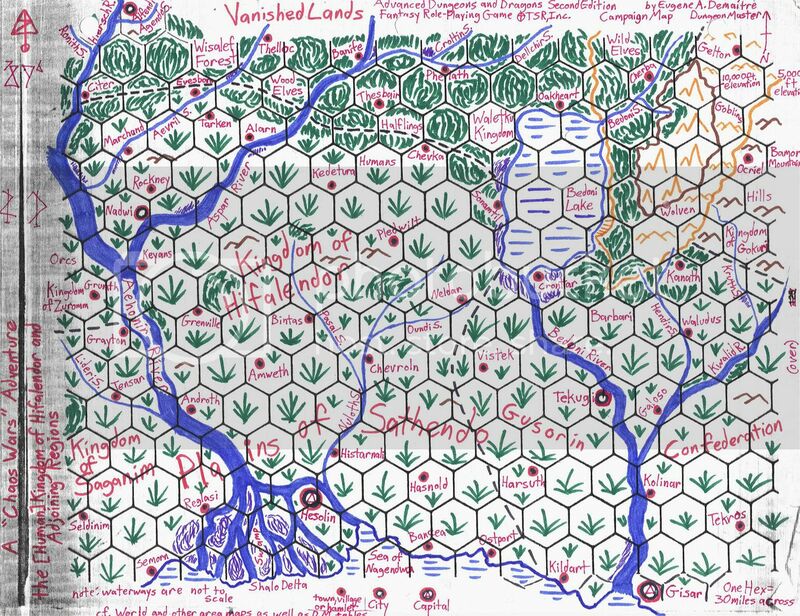 Fellow role-players, here are Josh’s and my notes for the “Vanished Lands: the Broken Chains” fantasy one-shot of Saturday, 19 November 2011, using FATE 3e Legends of Anglerre. In one ancient world, there was a region where demihumans and magic thrived. Travelers strove to be adventurers, and adventurers strove to become heroes amid wonders and perils. 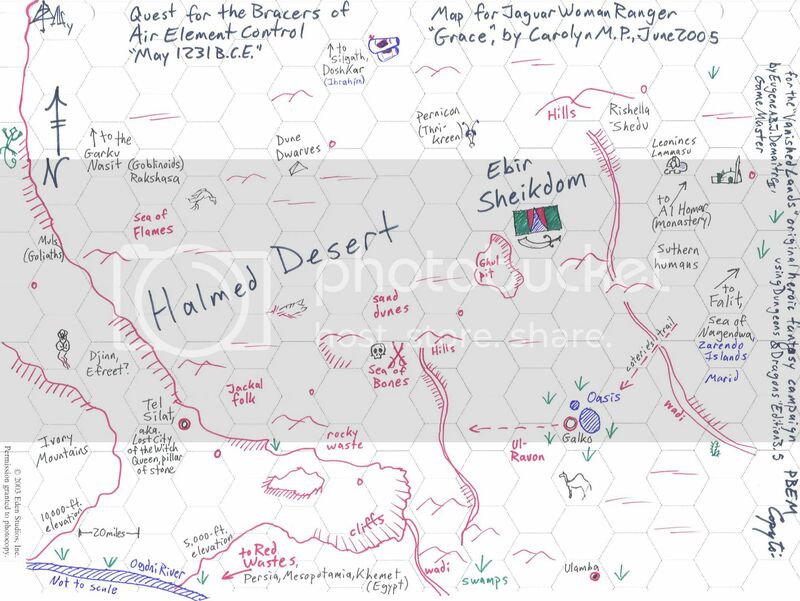 After the “Liberators,” “Dragonslayers,” and “Seekers of Lore” but before the “Faith-Based Initiative,” “Holy Steel,” and other wanderers explored the northwestern borderlands and the Sea of Nagendwa, the “Broken Chains” united in the Halmed Desert…. >>”1 to 6 October 1229 B.C.E., from the correspondence of Raz bar-Dini:” Dear father, it has been good to have helped people from far and wide. It has been too long since I’ve written, but my divination studies often take me away from the comforts of civilization. As such, I’m saddened to learn that you are currently out of town — no doubt bringing vast wealth to my mother and influence to our house — as I sit in your study penning this note. The latest exploits of the “Broken Chains” have brought me back to Falit for a few days at least. Perhaps I should start at the beginning. It has been about a year since my adventuring party traveled across the dangerous Halmed Desert together. As you know, I’ve been splitting my time between the Tower of Sight in the capital, my friends’ hidden oasis, and the lost city of Tel Silat. Mighty Kemosh has defended the oasis, escorted me safely to the archaeological site, and helped other former slaves. Kunal, a successful vendor of chilled snacks, had been trading with the Vanaka (Dune Dwarves). Our good friend Neela and her mate Tar were raising their cubs Iben, Nika, and Nar at our secret sanctuary. 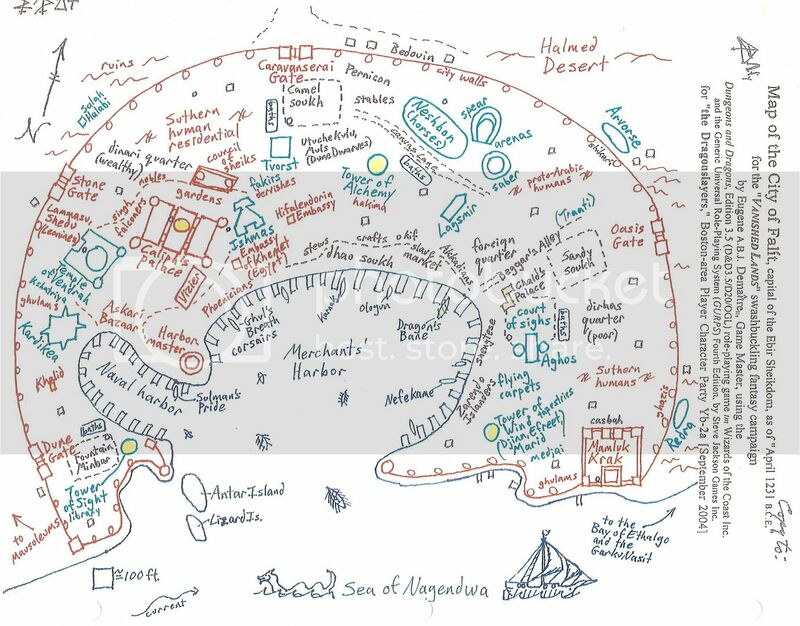 Honorable “Mumtaz” [Brian] had returned north to the cruel Garku Nasit, and eccentric preacher “Killian” [Greg D.C.] had taken up residence at Emein Island. I’ve lost track of our other associates. Several days ago, I was visiting the den of Neela, whose love for her cubs is already the stuff of legend. I was scribbling arcane characters on an exterior wall, working on a magical formula of recent discovery, when a horned being suddenly appeared before me! “Val August” spoke in Hifalendorin (northern human common) and offered to perform a service if I returned him from whence he came. The red-skinned man appeared to be middle aged, with fine robes and slippers and a winged Imp named Szaboch. Val said he had been working as a tax collector in the town of Pledwilt. He was just with Halfling assistant Oswald serving baronet “Kurick” [Dave S.C.] on the distant Plains of Sathendo! I determined that this creature couldn’t be a Djinn or Efreet, as he didn’t know the Suthern tongue. I then summoned Kemosh, whose valor is known from Falit to the corrupt tribes of Tel Silat — may the great Isis visit a pox on each of their houses. I asked the tall Anpur to make a quick patrol to ensure that nothing else had come through with our noble “daemon” guest. Neela herded her unruly cubs indoors, placed them under Tar’s care, and came to see the newcomer. Meanwhile, Kemosh called on Kunal, whose frozen treats are becoming known to all who need them, interrupting his negotiations with some Vanaka. The Kahin told the Sa’luk that he had found a dead camel at the edge of the oasis, opposite of where Val had appeared to me. Kemosh and Kunal had begun following tracks back toward us when we all heard an unearthly voice ask, “Where is he? Where are they?” I ran toward them and beheld a large naked humanoid whose swollen pink skin was dotted with irregular tufts of hair. From its fingers dangled torturer’s blades, already stained with the blood of another visitor to our oasis. Clawed Kemosh then leaped from a rock face to the monster and raked it. The horror split open like an oozing sausage and expressed masochistic pleasure. Nimble Kunal slashed with his adamantine saber, and Warlock Val drew a wand and threw fire at the beast, whose infernal nature protected it. Wise Neela cast Entangle, blocking the Outsider’s progress with oasis vegetation, and I cast Desiccate on its wounds, seemingly stopping them from unnaturally swift healing. My gorge rose, but I managed to rejoin the fight. Kemosh blocked a heavy blow with his four claws. Kunal stepped back, switched to a sling, and pulled out his sack of enchanted stones. I began Calling Sand from the desert’s edge, while Szaboch gave Val a scroll of Comprehend Languages. The knowledgeable Imp identified our foe as a Amaimon, an interrogator from the Nine Hells. Even as Kemosh continued clawing, Rogue Kunal hurled a sling stone, which turned into a boulder as it flew! It went straight through the torso of the devil, revealing innards of pink flesh without bones or organs. Neela called to her fellow Druid Kemosh to play tug of war with the Amaimon, who taunted Val. The horned gentleman tried to Bewilder the hunter, to no avail. After much dodging and tugging, the one tough mother and Anpur — with help from Kunal and me — rended the devil (not Val) limb from limb. Kemosh and I ground the still-regenerating remains into a paste, embedded them in rocks, and separated the rocks. Although I guessed that Val had tried to escape former diabolical overlords — and who hasn’t? — he claimed to be from the Prime Material plane of existence, like whoever summoned the Amaimon and him. At least fierce Neela and the so-called Tiefling don’t hold me responsible for this awkward meeting. Since we were all restless and wanted to get Val home, we bade farewell to Tar and the cubs, the Vanaka sand ship, and the oasis (we blindfolded Val as a precaution). A few days’ ride later, we arrived here, the capital of the Ebir Sheikdom. Falit‘s bustling soukhs have changed little in the past months, but we have seen things in cities and out in the sands that few have imagined. My counter-scrying had found that whatever had called the Amaimon was lurking beneath a wadi (dry stream bed) and long-abandoned oasis. We went to consult with my colleagues at the Tower of Wind, but Kunal made himself scarce rather than face another ordeal at the Mumlak krak (castle of slave/soldiers to the caliph). The Sa’luk said he had to see some guild or another, probably about smuggling. After months of “roughing it,” I was glad to behold the three towers of sorcery, especially the wide windows of the Tower of Wind. Flying carpets, winged mounts, Wizards in flight, and avian familiars filled the bright sky. I asked around and found my old friend Tarzu, a mist-shrouded Djinni with an opal gem in his turban. Tarzu confirmed that Val was not a demon and that I may have just intercepted the summoning that brought him and the Amaimon to our oasis. Val seemed relieved to have been spared a worse fate and hoped to return home (Pledwilt, not the kingdom of Gokuri). Kemosh and Neela, however, were determined to go to the dead oasis to root out the evil there, especially after we had knocked out the magical barrier [intended to block “Holy Steel”]. Kemosh and the Order of the Golden Lion were more worried about feral Anpur to the west and Hobgoblin legions from the north, and Neela wanted nobody to be able to track back to her cubs. I met with them and Val at a coffee shop to talk about our next misadventure…. 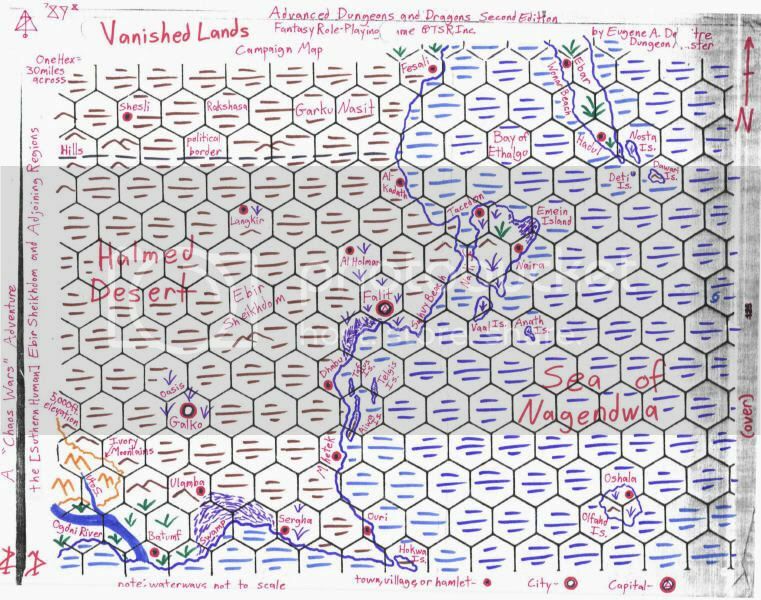 Byron, it was great to see you this past weekend, and I hope that everyone enjoyed our latest foray in the “Vanished Lands!” I thought that our quick-and-dirty conversions from D&D3.5 to FATE 3e Legends of Anglerre worked well enough, even though a longer-term campaign would require a closer look at aspects, powers, and items. Posted on November 22, 2011 by GeneD5Posted in Fantasy & Steampunk, Games, Vanished LandsTagged broken chains, byron, d&d, fate, legends of anglerre, rpg, visit.